on the right track (on track): doing something or thinking in a way that will lead to success. The businessman's mission statement has one symbol on it: a dollar sign ($). Yes, making money might be the ultimate goal but a mission statement provides more details / information about the purpose and values of the company or organization. So the businessman is on the right track about the mission statement—his thinking is going in the right direction—but he's left out all of the reasons why they want to make money. 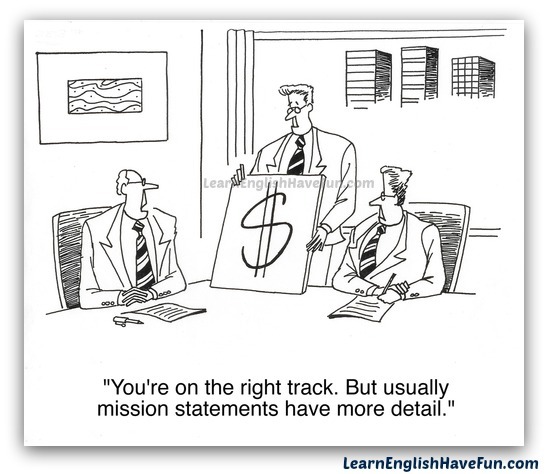 This idiom talks about being on the right track or being on track. A track is a line of rails that the wheels of a train follow to stay on the correct path and go in a single direction. So this idiom is talking about following the right direction—the path that will lead you in the right direction to the place you want to arrive (success). Here are some more examples to help make this idiom clearer. Mr. Jones, I haven't solved the equation yet but can you look at my work and tell me if I'm on the right track? You've lost 15 lbs since your last doctor's appointment and lowered your cholesterol levels. And, now your blood pressure is also on the right track! Great job! Finally, my son stopped smoking pot and skipping class. It seems he's finally on the right track and will manage to graduate with his class in the spring. We're on the right track to get to grandma's house by 5 PM unless we run into traffic. Did you see the latest figures? We're on the right track to meeting our sales quota for the quarter. Even though you didn't get the job I think you're on the right track because you're getting lots of call backs for interviews. Don't worry, you'll get a job offer soon. We're on track for completing the prototype by the end of the month. I just had my performance review and my boss said I'm on the right track for a promotion next year. "Help! I can't finish this algebra equation!" "Calm down and keep thinking son, you're on the right track." I think we're on track for completing the report by tomorrow afternoon. Could you take a moment on Thursday to proofread and edit it? Now, it's your opportunity to practice this idiom. Practicing is a great way to help remember new idioms and vocabulary. Are you on the right track to becoming fluent in English? What else can you do to stay on track? Write a sentence below and I will give feedback!